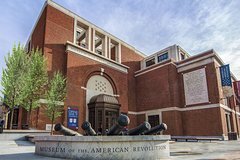 The Museum of the American Revolution explores the dramatic, surprising story of the American Revolution through its unmatched collection of Revolutionary-era weapons, personal items, documents, and works of art. Immersive galleries, powerful theater experiences, and digital touchscreens bring to life the diverse array of people who created a new nation against incredible odds. Visitors gain a deeper appreciation for how this nation came to be and feel inspired to consider their role in the ongoing promise of the American Revolution. Located just steps from Independence Hall, the Museum serves as a portal to the region’s many Revolutionary sites, sparking interest, providing context, and encouraging exploration. The 118,000-square-foot museum, located in the historic heart of Philadelphia, illuminates America’s founding generation, honoring those who risked everything to secure the liberties that continue to influence the world. The Museum features art, manuscripts, personal diaries, plus British, French, and American weaponry spanning from the 1760s to the rise of armed resistance — and eventually, hard-won independence. High-tech media, digital interactives, hands-on experiences, and personal interactions with guides enhance each visitor's experiences. Immersive environments include an Oneida council house where visitors will witness the historic debate among the Oneida people in the decision to break with the ancient Iroquois Confederacy and join the American cause; the Battlefield Theater, where visitors are placed on the Continental Army's front lines to face an attack by British Soldiers; and a full-scale replica of a privateer ship that went to sea to challenge the British Navy. A dynamic theater houses one of the most iconic surviving artifacts of the American Revolution — General George Washington’s headquarters tent. It was in this tent that the nation's first commander-in-chief directed the war while in the field, holding meetings and making decisions that changed the course of history. Visitors will leave the museum with a deeper understanding of the people, the ideas, and the events that gave birth to America, and will be prepared to explore historic Philadelphia, the headquarters of the American Revolution. Additional museum amenities include a gift shop, plus the Cross Keys Cafe, featuring breakfast, lunch, and snack options. The Museum of the American Revolution is conveniently located just two blocks from Independence Hall, the Liberty Bell Center, and Independence Mall.